Ella Ostlund (left) watches a video with Kevin Pelphrey while researchers monitor her eye movements to determine exactly where she is looking. They record her brain activity to determine how she processes what she is seeing. (Logan Werlinger/ GW Today). A George Washington University-led national collaborative network aimed at improving outcomes for children diagnosed with autism spectrum disorder (ASD) will receive more than $11.7 million from the National Institutes of Health (NIH) over the next five years to help propel innovative research in the field. Kevin Pelphrey, director of the GW Autism and Neurodevelopmental Disorders Institute (ANDI) and his colleagues will follow children through adolescence and into adulthood to understand differences in ASD risk between boys and girls and in how they each respond to interventions. Although boys may be more at risk, the symptoms of autism materialize differently and sometimes less severely in girls, Dr. Pelphrey said. Because of these differences, many girls go undiagnosed and miss a significant window for impactful treatments. Experts have typically focused on early development and infancy as the primary time for treatment intervention for individuals with ASD. Many children, however, are not diagnosed until they are a few years older. Teenage years, he said, present a “second major opportunity” that to date has not been a research focus. Dr. Pelphrey is also one of the first researchers in this field to focus heavily on girls with ASD. As part of this evolving research, the team has for the first time enlisted women and girls with ASD to be researchers as part of a self-advocacy initiative through a key collaboration with Children’s National Health System. Participants will help examine brain data and talk about the diagnosis process. The advocates also will interact with the research team to provide information about how the lab’s results match up with their diagnosis experience. Dr. Pelphrey expects this process to generate interesting insights on how to further explore the data and make it more useful going forward. GW leads an NIH-designated Autism Center of Excellence (ACE) network. The ACE program was created in 2007 from the consolidation of previous programs. The NIH has awarded ACE grants every five years, and 2017 marks the third grant cycle. Dr. Pelphrey first received part of the grant funding in 2012 before coming to GW. Building on the research initially funded in 2012, Dr. Pelphrey and ACE network collaborators from Harvard University/Boston Children’s Hospital, Children’s National Health System, Seattle Children’s Hospital/University of Washington, Johns Hopkins University, the University of California-Los Angeles, the University of Southern California, the University of California-San Francisco, University of Colorado-Denver and Yale University will continue to follow subjects who were studied in the first phase through adolescence. Over the past five years the collaborating institutions collected information on an unparalleled study sample, gathering genetic, brain imaging and behavioral data on 250 girls and 250 boys with autism, 200 siblings of people with autism, and 200 typically developing girls and boys, all within the range of 6 to 17 years old. 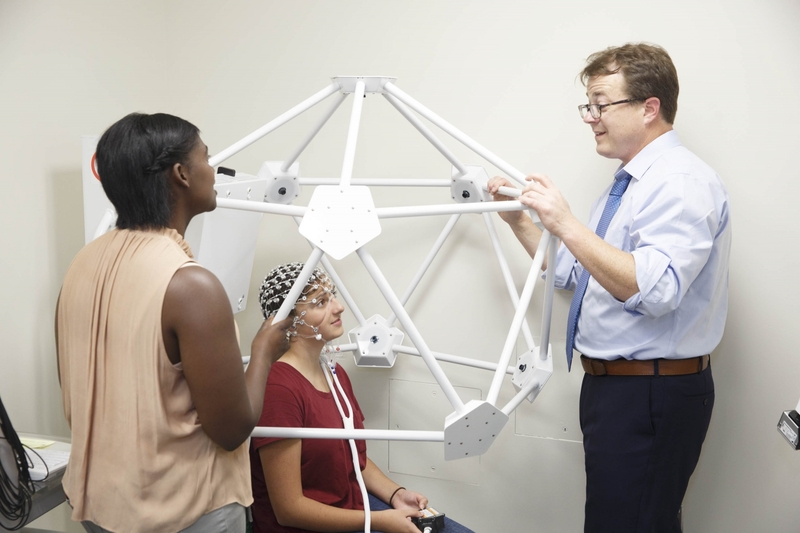 “That allowed us to start to try to understand the relationship among genes and brain behavior in those kids and look for biomarkers of developmental pathways that might differ for boys and girls,” Dr. Pelphrey said. Researchers will collect the same data on the participants in this second phase, Dr. Pelphrey said. This will allow them to start charting differing developmental trajectories as the study participants get older and move through key developmental transitions, through puberty and into young adulthood. The ACE collaborators are the first group that he knows of to seriously look at how hormone levels in adolescence interact with brain and genetic differences to produce differences in the expression of autism. They will look at both boys and girls and the differences between them on an individual level. ANDI is currently based out of a Monroe Hall lab. Additional facilities for autism research on the Virginia Science and Technology Campus (VSTC) will open in spring 2018. When the facilities open, researchers at VSTC will be recruiting young adults with autism, siblings and typically developing individuals to participate in ACE network follow up studies. Funds from the Carbonell Family Foundation gift to ANDI will be used to extend the research of the ACE network to include very young children. Clinicians also will offer services and treatment for autism and other neurodevelopmental disorders for patients of all ages. A GW-based research project that aims to understand ASD diagnosis disparity received five-year renewal funding.